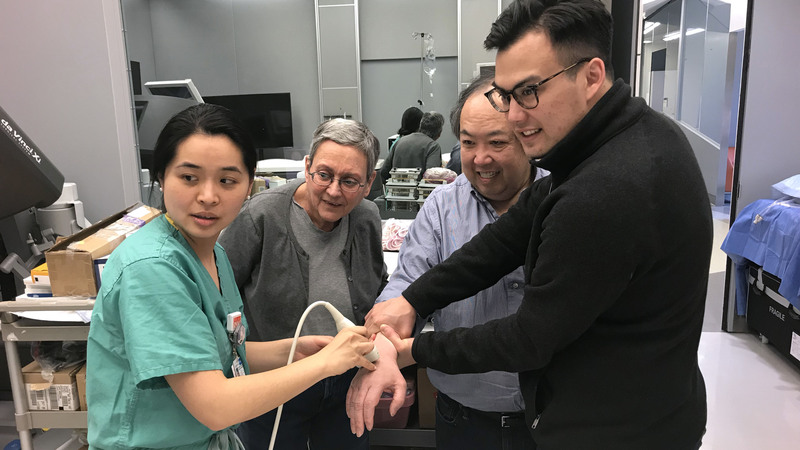 Family and friends got a hands-on look at the daily challenges that anesthesiologists face at the second annual Family Simulation Day, hosted by the Department of Anesthesiology's Residency Support Council (RSC). Ten residents and 11 guests took part in the event, held in the Skills Acquisition and Innovation Laboratory (SAIL) on March 23. "We hope our guests were able to gain a greater insight into our day-to-day work lives, in order to improve their ability as a support system and help prevent resident burnout," said CA2 resident Dr. Matthew Perlstein, an organizer of the event. Other organizers were residents Drs. Christina Lee, Casey Chai and Janessa Job; Dr. Lori Rubin, associate professor of clinical anesthesiology and co-director of SAIL; SAIL staff Jay Rosenberg, Iskander Bagautdinov and Xiomara Garcia; and Lisa Cabrera. "It was so rewarding to give our family and friends a look into the world of anesthesiology," said Dr. Perlstein.